REST is defined as an option for web services and Remote Procedure calls. It is used for designing network applications. In REST, both the state and the functionality are presented as resources. Resources are the key element of a RESTful design, as opposed to “methods” or “services” used in RPC and SOAP Web Services. RPC calls like “getProductName” and “getProductPrice” are not used in REST. You view the product data as a resource and this resource should contain all the required information. It means that a single resource should not contain detailed data and it contains links to additional web pages. 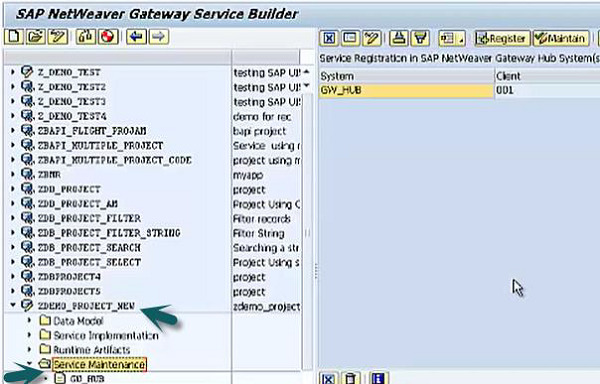 In REST client–server model, one component server can be other component client. Each request should contain details about the connection to each client and should not reply on the previous connections to the same client. The protocol must allow the server to explicitly specify which resources may be cached, and for how long. To improve performance and scalability, Proxy servers can be used. Any standard HTTP proxy can be used. A new window will open. Click Create Project. Enter the Project name as shown in the image below. It should be unique and should not contain any special characters. Enter the description of the project as it is a mandatory field. Enter the different attributes such as Project Type,Generation Strategy. Select Package or click the local object, if you want to create this locally. Once you click the local object, Service builder will create a new project with empty folder structure. All these are automatically created with a new project and click the save icon. Now, to create an Entity type in data model. Expand the Data model → right click → Create → Entity Type. Enter the Entity type name and to create an entity set automatically, click on related entity set check box option. Click the option Insert row to add another entity type in data model and add the details as given below. Click Save. In a similar way, you can create an entity set by right-clicking the data model and enter the details or by using the Insert Row option in Entity Type. The next step is to define association and relationship between different entities. It can be created in two ways, by using a wizard or by using mask edit view. Click the Association set. Right click data model → Create → Association Set. 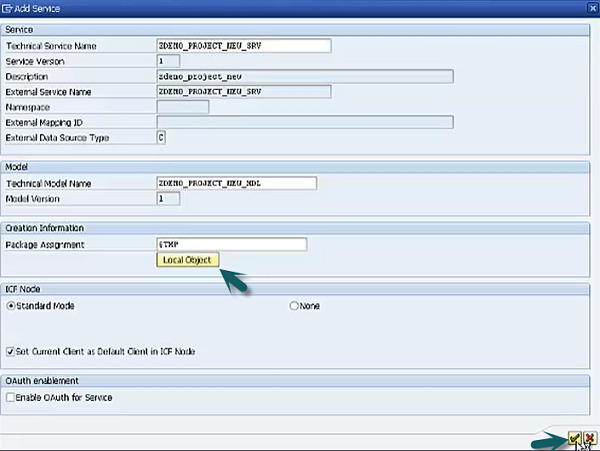 To create Function Import in Service Builder, right click Data Model → Create → Function Import. Enter the name of Function Import and you can select from other options and click the save icon. To define complex type, go to Data Model → right Click → Complex type. Enter the details as per the requirement and Save. This is how you can create Data model, Entity set, type, Association and Complex types. Enter the path and import Entity types, Entity sets, associations and complex types. Enter the local or remote system data source, type and Name and save. This will enable mapping node under query operation. You can do mapping for single objects or can also use the option of Propose mapping option. Go to Data Model. Double-click Service Maintenance. Select the system you want to register and click the Register option at the top. Select the project → Local Object and then save by clicking the tick mark. Check the Service Registration status. To maintain the service, click the Maintain button. Another window will open. Click Call browser and select to use this service as URL. 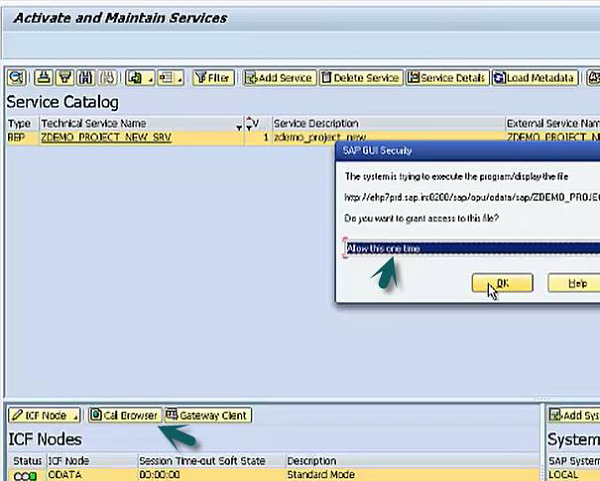 Click OK.
A browser will open; enter the user name and password to see if service is exposed as OData service.